My friend's little boy has just turned 4 and I really didn't know what to do for his birthday card! I've got lots of girly images but no boy ones so I felt the need to do a little shopping and update my stamp collection to include some stamps suitable for little boys. I came up with Cakey Watt by Stamping Bella and that was it. I may have also bought some more girly images too - oops! This little robot is just soooooooo cute - I love him! I coloured him with my copics and used the warm greys for the first time. They were a bit juicy and saturated the card in a few places causing some of the colours to bleed slightly which was annoying but I covered most of it up with more shading and a shadow outline. I finished off with some bolt brads and some bakers twine and I printed the sentiment on my pc. I'm going to enter this card in the 'My Heart Pieces' challenge this week which is to use designer paper, and the Paper Crafting Journey challenge which is 'Anything Goes' and the Waste Not Wednesday challenge which is to use your forgotten or neglected stash - I've had those brads for about 3 years now so they definitely qualify! 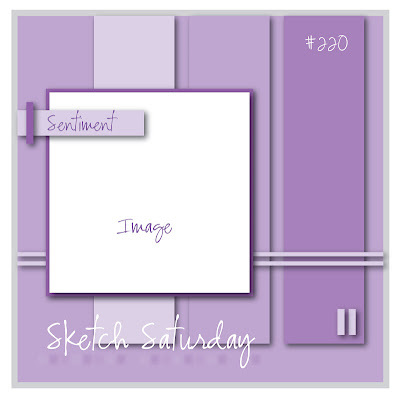 The Sketch Saturday challenge this week is sponsored by Simon Says Stamp and there is a fabby prize on offer so pop on over and join in the fun! Beautiful card, fantastic image with delightful backing papers. Thanks for joining us at My Heart Pieces Challenges. Oh this is fab honey - I love love love robots so its a winner for me!! Oh wow what a image, great use of paper. Thank You so much for joining with us at My Heart Pieces,hope to see you again next week and don't forget to check back if you are the winner.